Aim: Dental caries among school children in Saudi Arabia is a significant concern since the prevalence is high, prevention starts with education of the publicity and delivery of the correct information regarding the preventive measures and the nature of the dental disease. Several studies regarding oral health education through community programs revealed a good result in reducing the prevalence and incidence of the oral diseases. Our study aims to assess new methods in oral health education for primary school children. Materials and Methods: This study is an interventional study, convenient sample method of 750 students selected with no intellectual disability from seven primary schools in Saudi Arabia; students' ages range from 6 to 9 years old. In the conventional method, two dental students trained in the demonstration through a PowerPoint presentation illustrated with diagrams and a jaw model. Animation video prepared through online website includes all the points presented in the conventional education. A questionnaire designed to evaluate all provided information with ten questions to assess the knowledge of the student after immediately oral health education. The statistical test used was the nonparametric Chi-square test. Results: A total of 750 students were involved, and the same number of questioner collected in both methods, 12 questionnaires have been excluded six from the conventional and six from the animation either the student did not answer, or the questionnaire is not readable. Data from 738 questionnaires were available (369 conventional and 369 animations). Overall, the statistical analysis show proximate result for both groups of methods was noticed with each to have merit and demerit. Conclusions: Oral health education and motivation is part of the dentistry, and the dental team work, the animation or the conventional method both have been noticed to be effective in delivering the relevant information the children must know about the oral health. In 2012, the World Health Organization had published a fact sheet founding that the most common oral disease to be dental caries, affecting 60%–90% of the school children and nearly 100% of adults worldwide. Despite the fact that the advance in the knowledge of the nature of dental caries is still a significant problem that needs particular attention. Al Saffan et al. study show revealed that the primary and intermediate private school students overall and topic-specific oral health knowledge improved immediately after the educational intervention provided by King Salman Centre for Children's Health. A review published by Stein stated that the traditional oral health education was effective in reducing plaque accumulation in short period, but not useful for gingivitis while for caries the findings were conflicting. According to Systematic Review and Meta-analysis reported by Alayyan et al. in 2017 stated that mean decayed, missing, and filled teeth (DMFT) for the permanent teeth in the Kingdom of Saudi Arabia range was (0.41–7.35) and the prevalence (57.2%–92.3%), where the most common report cause was exposure to a cariogenic diet. In a study done by Al Agili, she found that the prevalence of dental caries among children in Saudi Arabia estimated to be approximately 80% for primary dentition with a mean DMFT score 5.0, and about 70% for their permanent teeth with a mean DMFT score 3.5. Dental caries found to affect the children eating habit and their nutritional intake which may influence the body and mental growth and readiness for school. Pain and infection caused by dental carious lesion lead to multiple absences from school which affects the children education progress. The significant effects of dental caries if untreated not limited only to the mastication function but also affect speech, smile, and psychosocial environment and the quality of life. Essential programs such as public health, community- and school-based educational, and interventional programs found to improve oral health outcomes. Starting prevention program in school children with multimedia tools more favorable in this population as seen in a study done by Richard and Moreno, who found a multimedia instructional environment has an enormous potential to improve the people capability to learn. A learner who receive material in the forms of verbal and pictorial static such as photos or illustrations and dynamic content such as video or animation forms. Their encouraging the ability to understand can be enhanced by the addition of visual forms of presentation. Animation simplifies a more descriptive and procedure education. Animated multimedia has seen to be more appealing and enjoyable for learners as found in a study done by Chanlin., Shah and khan stated Multimedia-aided Teaching had changed the teaching and learning process. The lessons presented in this way are more efficient and better comprehended. Multimedia-Aided teaching more effective than the traditional way of teaching. According to study was done in Malaysia, it is concluded that cartoon animation enhances oral health education delivery to preschool children in Hulu Terengganu District. Draw attention to the importance of the oral health education since the early age of human being. Ethical approval obtained from the Ethical Review Committee of the Riyadh Elm University has approved the study. The Institutional Review Board approved the study design and the protocol (RC/IRB/2016/343) with research registration number (FRP/2016/128). This is an interventional study starting from March 22, 2017, to May 3, 2017, was carried out in seven primary schools, three in Riyadh city, one in Al-Hasa city, one in Dammam city, one in Safwa city and one in Al-Qaṭif city in the Kingdom of Saudi Arabia. Ethical approval and school permission had been obtained prior to visit schools, and the overall targeted population was 750 Saudi males primary school students with no intellectual disability divided into two groups. Targeted age from 6 to 9-years-old, the sample collected from Riyadh and Eastern Province by using convenient sampling method. Researcher visit seven schools targeted two equal amounts of students in each class from each first, second, and third grade. Group (A) – the (Conventional group) received conventional oral health education by three pretrained dental students to minimize the inter-variability in the delivery of the information for the students. Conventional tools such as diagrams, images illustrating different procedure and oral health practice with the assist of jaw model have used. Group (B) – the (Animation group) received oral health education in the form of an animated cartoon. An animated educational video about oral health care and best brushing technique and healthy food benefit and sugary food effect on the teeth, children were advised about the regular dental visits. After delivery of the information in both methods premade multiple choice questionnaires were designed in the in the form of pictures and images contain ten questions distributed to the children to make it simple for the student to answer the questionnaire. The test was completely anonymous. The study divided into two separate phases. The first phase consisted in the administration of delivery of the information in both methods the time for the conventional was 15 min were animation was 3 min. The second phase was the administration of questionnaires and data collection. The collected data were then statistically analyzed. The data analyzed using SPSS version 16 (SPSS Inc. Released 2007. SPSS for Windows, Version 16.0. Chicago, SPSS Inc, USA). The nonparametric Chi-square test utilized to retrieve the results. The same questionnaire has been used for both groups. Animated video has been done by the researcher with using of GoAnimate with core message focusing on (tooth eruption time of primary and permanent teeth, number of primary and permanent teeth, tooth brushing, diet, annual dentist visits and tooth brushing technique, dental floss, and habits related to teeth). The animation duration was executed to be as short as possible but at the same time concentrated with information that is important. The standardized point of information for the conventional method to be explained by the educator was emphasized focusing on same as the animation method core message (age first tooth eruption in the mouth, number of primary teeth, number of permanent teeth, causes of tooth decay number of visits to the dentist, food and drinks causing tooth decay method to clean teeth, and good and bad habits related to teeth). For the purpose of analysis, each correct answer has given a score (one), wrong and empty answers given a score (zero) in the questioner. Chi-square test and were applied. P < 0.05 was considered statistically significant difference. The data were analyzed using the SPSS version 16 software. 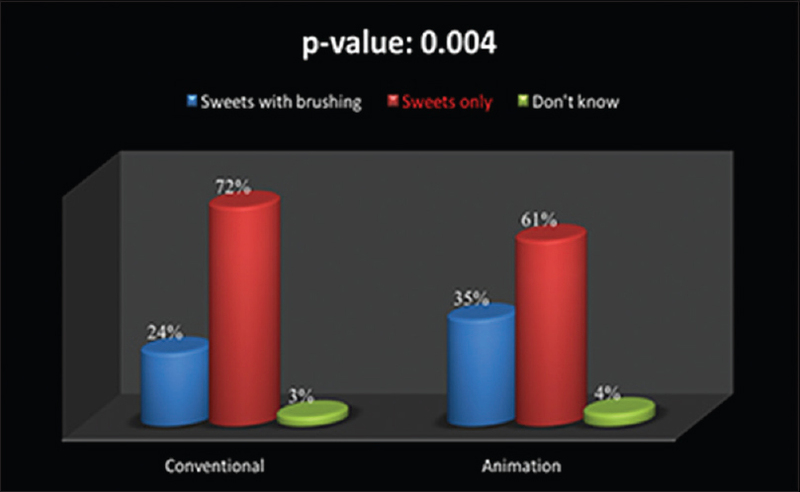 In this study, both conventional and animation groups show a relatively same result. The entire individual of this study is 750 students. A total of 750 questionnaires were distributed [Figure 1], 12 questionnaires have been excluded six from the conventional and six from the animation either the student did not answer, or the questionnaire is not readable [Figure 2]. Three hundred and sixty-nine answers of a conventional method have been collected and the same number for the animation method. Statistical analysis was done by Chi-square test with SPSS version 16. Chi-square test obtained for each question to assess the result of both methods [Figure 3], [Figure 4], [Figure 5], [Figure 6], [Figure 7], [Figure 8], [Figure 9], [Figure 10], [Figure 11], [Figure 12]. [Figure 3] shows the result for 1st question tested by Chi-square test; the statistical difference is significant between the animation method and the conventional method; with the animation have more correct answers. [Figure 4] shows the result for 2nd question tested by Chi-square test; the statistical difference is significant between the animation method and the conventional method; with the traditional have more correct answers. [Figure 5] shows the result for 3rd question tested by Chi-square test; the statistical difference is not significant between the animation method and the conventional method. [Figure 6] shows the result for 4th question tested by Chi-square test; the statistical difference is significant between the animation method and the conventional method; with the traditional have more correct answers. 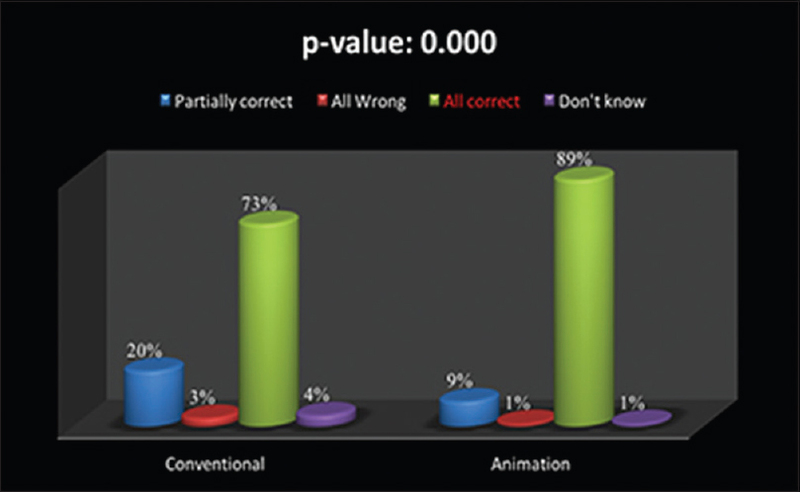 [Figure 7] shows the result for 5th question tested by Chi-square test; the statistical difference is significant between the animation method and the conventional method; with the traditional have more correct answers. 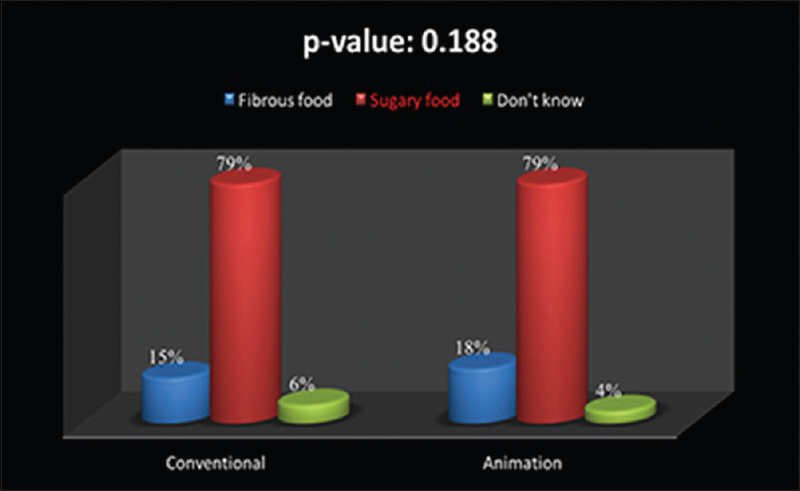 [Figure 8] shows the result for 6th question tested by Chi-square test; the statistical difference is not significant between the animation method and the conventional method. [Figure 9] shows the result for 7th question tested by Chi-square test; the statistical difference is not significant between the animation method and the conventional method. [Figure 10] shows the result for 8th question tested by Chi-square test; the statistical difference is not significant between the animation method and the conventional method. [Figure 11] shows the result for 9th question tested by Chi-square test; the statistical difference is significant between the animation method and the conventional method; with the animation have more correct answers. [Figure 12] shows the result for 10th question tested by Chi-square test; the statistical difference is significant between the animation method and the conventional method; with the animation have correct answers. 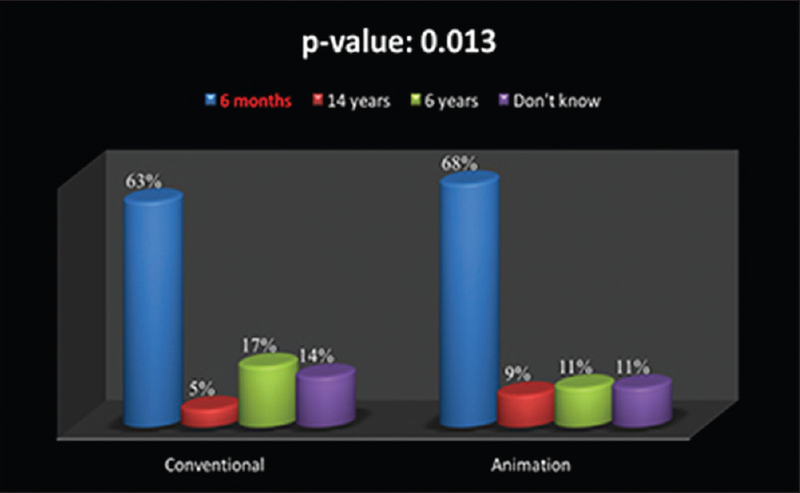 According to the descriptive statistic with Chi-square test [Table 1], our result show three questions Q1, 9, 10 show a prevalence of animation method on the conventional method, and three questions Q2, 4, 5 show the prevalence of conventional method on the animation method. Other questions Q3, 6, 7, 8 show no significant difference between both methods. 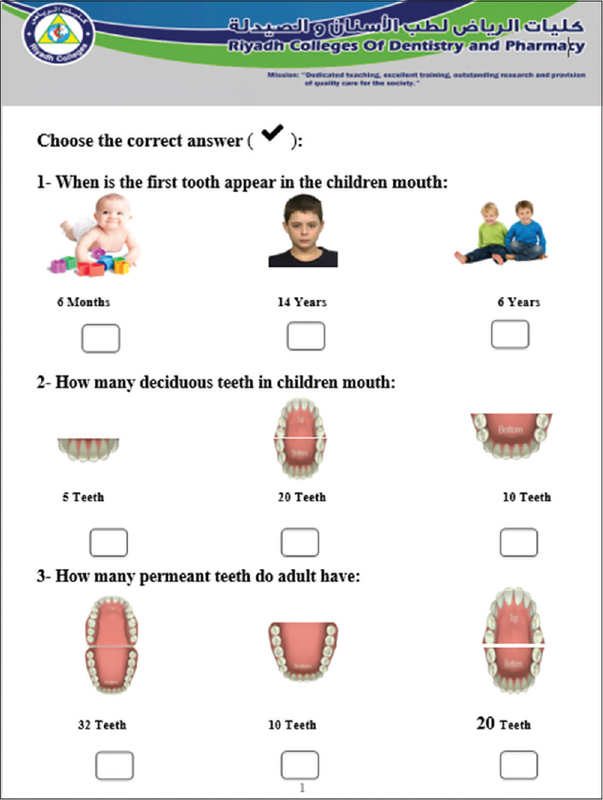 The animation shows correct answers in part related to the morphological aspect like in question number 1, the section related to oral hygiene like question number 9, and the part pertaining to the good and bad oral habits like question number 10. In contrast, the conventional method shows more correct answers in the anatomical aspect like question number 2, the part related to the cariogenic food, the section about the regular dental visit like question number 5. Children (student) were more interactive with the conventional method while in animation method the interaction was less, this supported by similar result were reported by Chanlin. In contrast, Shah and Khan have stated that the attraction of animated video on the children (student) result in increased attention toward the information given by animation. Our finding shows that both methods have advantages and disadvantages, one of the advantages of the animation method its take less time to educate the children and deliver the information. 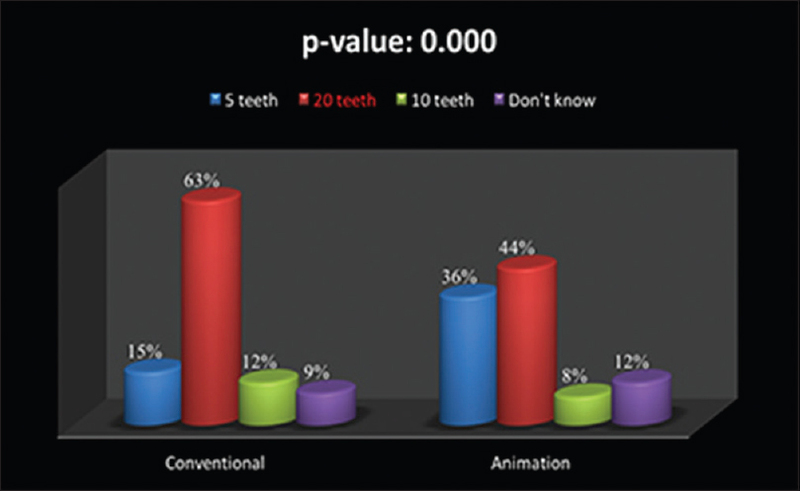 The animation method requires less effort in the explanation of oral health education comparing to the conventional method. 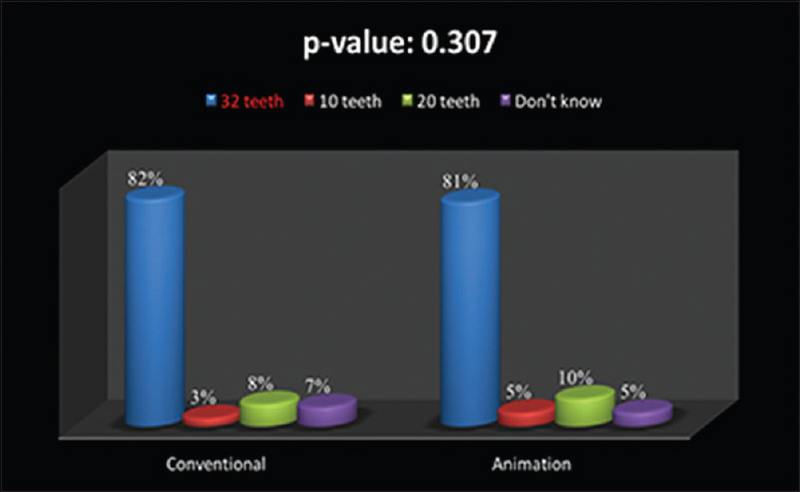 Sinor in his study found that animation medium was more efficient and sustainable in delivering oral health education compared to conventional method. On the other hand, we found in the traditional method interaction between the educator and the student was noticed to influence the educator evaluation of the children perception of the information which may induce more explanation or repeating the information. Based on this comparison between both methods, we found both to have the same effectiveness, with each to have merit and demerit. One of the disadvantages of the animation method, it requires a special team to execute the animated video. Therefore, it is more financially demanding. The purpose of this study was to make a comparison between the conventional health education and the multimedia using in the health education and assess the effectiveness of both methods on the children perception toward oral health education, in contrast to a study done by Sinor study which evaluated the improvement of the knowledge after continuous education for week. 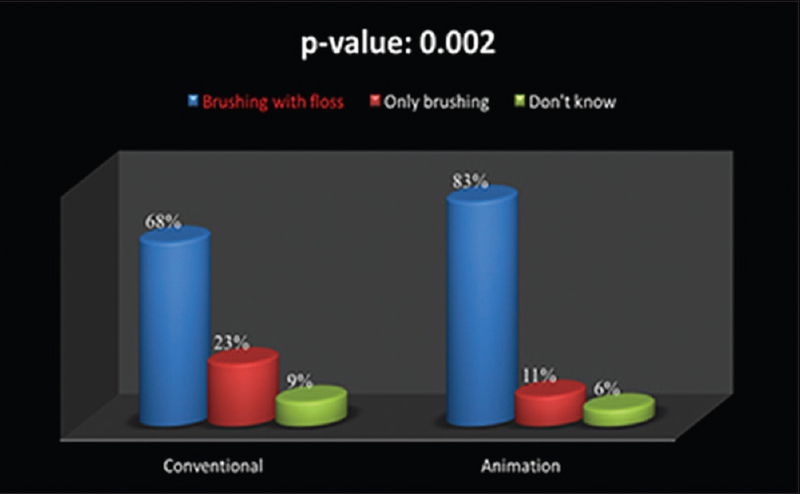 One of the limitations of this study that lack of the interval between the conventional and animated oral health education and the test of the perception throw the questionnaire, a difficulty in achieving standardization in the conventional method create bias issue problem. Oral health education and motivation is part of the dentistry, and the dental teamwork, the animation or the conventional method both have been noticed to be effective in delivering the relevant information the children must know about the oral health. We conclude that animation method is favorable these days since the technology revolution eases the knowledge and make it more consumable for the new generation. The conventional method depends more on the educator and his/her knowledge, and the enthusiasms. The economic state of each oral health promotion program has significant influence in the selection of the method. Special thanks goes to all the schools that we have visited it [Figure 13]. I wish to express my heartfelt gratitude to Asnan Magazine, Nahj Altagwa Clinics, World Smile Dental clinics and Tuqa Aldawood in providing financial assistance for our study. World Health Organization. Oral Health. Fact Sheet N 318. Geneva (CH): World Health Organization; 2012. Available from: http://www.who.int/mediacentre/factsheets/fs318/en/. [Last accessed on 2017 Nov 5]. Al Saffan AD, Baseer MA, Alshammary AA, Assery M, Kamel A, Rahman G, et al. Impact of oral health education on oral health knowledge of private school children in Riyadh city, Saudi Arabia. J Int Soc Prev Community Dent 2017;7:S186-93. Stein C, Santos NM, Hilgert JB, Hugo FN. Effectiveness of oral health education on oral hygiene and dental caries in schoolchildren: Systematic review and meta-analysis. Community Dent Oral Epidemiol 2018;46:30-7. Alayyan W, Al Halabi M, Hussein I, Khamis A, Kowash M. A systematic review and meta-analysis of school children's caries studies in Gulf Cooperation Council states. J Int Soc Prev Community Dent 2017;7:234-41. Al Agili DE. 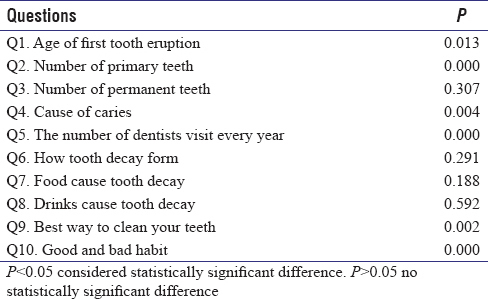 A systematic review of population-based dental caries studies among children in Saudi Arabia. Saudi Dent J 2013;25:3-11. Mathur VP, Dhillon JK. Dental caries: A disease which needs attention. Indian J Pediatr 2018;85:202-6. Pitts NB, Zero D. White Paper on Dental Caries Prevention and Management. FDI World Dental Federation; 2016. Richard ME, Moreno R. Animation as an aid to multimedia learning. Educ Psychol Rev 2002;14:87-99. Chanlin LJ. Attributes of animation for learning scientific knowledge. J Instr Psychol 2000;27:228. Available from: https://www.questia.com/read/1G1-68998589/attributes-of-animation-for-learning-scientific-knowledge. [Last accessed on 2018 Apr 21]. Sushma J. Studying the Effectiveness of Animation and Graphics with Text on Fourth, Fifth and Sixth Graders. Dissertation University of Nebraska – Lincoln; 2003. Available from: http://citeseerx.ist.psu.edu/viewdoc/download?doi=10.1.1.112.5096&rep=rep1&type=pdf. [Last accessed on 2018 Apr 21]. Iqbal S, Muhammad K. Impact of multimedia-aided teaching on students' academic achievement and attitude at elementary level. US China Educ Rev A 2015;5:349-60. Available from: http://www.davidpublisher.org/Public/uploads/Contribute/556fad46a6d6f.pdf. [Last accessed on 2018 Apr 21]. Sinor MZ. 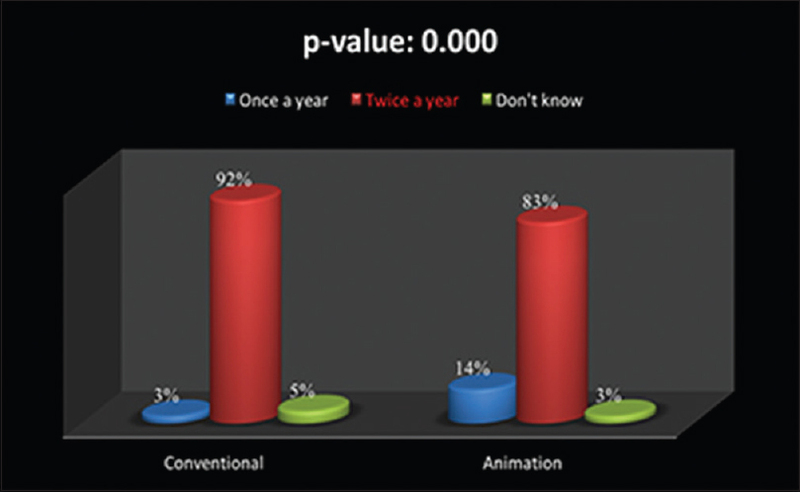 Comparison between conventional health promotion and use of cartoon animation in delivering oral health education. Int J Human Soc Sci 2011;1:169-74. Available from: http://www.ijhssnet.com/journals/Vol._1_No._3;_March_2011/24.pdf. [Last accessed on 2018 Apr 21].